Sure enough, he resurfaced and began swimming to shore. I thought his friends would fallow in sequence jumping next, but they did not. 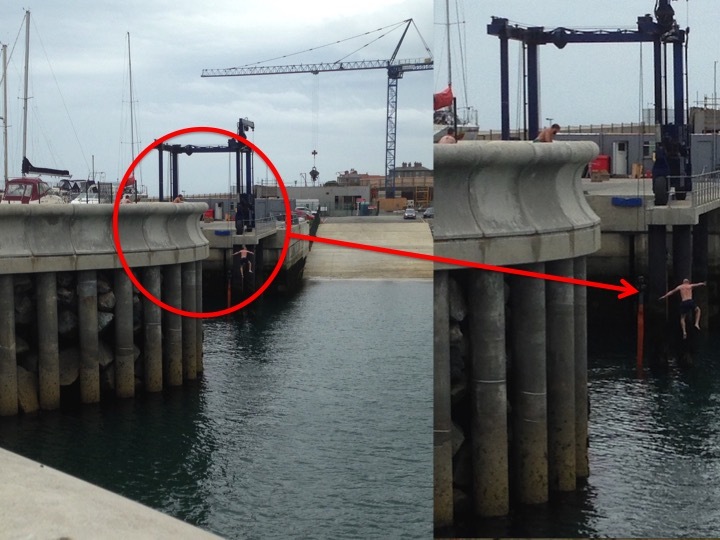 They waited until the jumper made it back up onto the pier wall having completing his very long self-indulgent glory run, cheering and whooping along the way. I wondered whether this was an individual test or group challenge that had been set. The men whooped and shouted, congratulatory slapping the jumper on the back at his return. The three men laughed loudly and the jumper expressively reenacted his jump through mime. Then it was clear another man intended to jump. He began the earlier sequence of actions carried out by the first man; he jumped up onto the pier wall looked over the edge, back down off the wall, shadow boxing, chest beating, shouting, shoving … then he ran, climbed up onto the pier wall and jumped off into harbor below. This time my camera was ready. Happily I turned to my wife – “I got it!” Knowing I had captured a perfect illustration of men partaking in a perceived test of masculinity. These men were taking a significant risk. There are many signs positioned around the harbor and marina explicitly stating diving is neither safe nor permitted. Engaging in rule breaking, carrying out a physically challenging task and taking a substantial risk all culminate in what Michael Kimmel (1997: 309) would describe as the “vigorous ways” men “demonstrate their hardy manhood”. Kimmel (1997: 310) states, often “men’s bodies” are used as a “masculine testing ground”. These men were indeed publicly testing their bodies, and the limits of their resolve. There was a certain ritualistic sequence to their pier jumping; the psyching up, surveying the field, the taunting / rallying from peers, more psyching up, the jump itself, the glory run to and congratulation from peers, and then the repeat of this sequence by the next man. However, it was the very public nature of this risky activity that fascinated me so. It reminded me of something Matthew Desmond (2007: 7) wrote: “the drama of manhood must be performed ardently, publicly, and without end, and one way this is accomplished is through activity that threatens male bodies”. Kimmel, M. (1997) Manhood in America – A Cultural History. New York, London & Toronto: The Free Press.